A cultural critique and exploration of self-consciousness, arguing that in our unprecedented age of mediated environments – with our overly documented and overly “social” lives – this uniquely human (and often beneficial) trait is now being amplified to an unhealthy extreme. Weaving together histories of science, thought, and innovation, with characters ranging from a Renaissance-era Instagram account to extreme athletes, from Descartes to the controversy surrounding a selfie-taking monkey; a fascinating new frame within which to understand our modern moment and the pervasive anxiety and alienation of living increasingly performative lives. 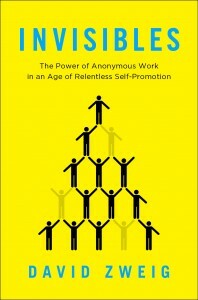 INVISIBLES: The Power of Anonymous Work in an Age of Relentless Self-Promotion, (Portfolio/Penguin, June 2014). Journalist David Zweig explores what we can learn about satisfaction and achievement from the Invisibles among us—the fact checkers, anesthesiologists, structural engineers, and other professionals who derive satisfaction from anonymous work despite living in a culture of praise. Driven by narratives of Invisibles in action, complemented by perspectives and studies from leading psychological, sociological, and business authorities, Invisibles offers readers multiple levels of enjoyment, from over-the-shoulder who knew?! journeys into some of society’s fascinating and often obscure lines of work, to new insights from the researchers and thinkers who attempt to quantify and qualify our relationship to our work, to possible answers to the biggest questions of what makes for a rich and meaningful life. On the verge of success, struggling New York City musician Daniel Green has his life’s dream snatched from him. Despondent, Dan seeks solace and answers from the comforts of women, great thinkers from Marx to Kierkegaard, and the security of rice milk. 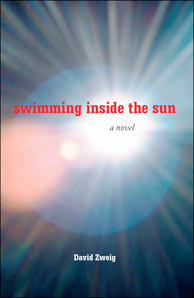 Suffering from a darkly comical state of extreme self-consciousness, Dan begins to lose his grip on reality, and in a meta-fictional twist, the narrative shifts from first to third-person as his depersonalization peaks. All the while, the signs of his existential dilemma become, literally, the writing on the wall, as his studio apartment is increasingly taken over by The Notes he can’t seem to stop writing. Battling loneliness and a mind that can no longer discern between fiction and real life, Dan’s only hope may be the redemptive force of music. In a culture obsessed with tales of winners’ ascensions to the top, Dan Green’s story, defiantly, irreverently, is about what happens when you fail and the roads you take to figure out what next?